Speaking before the 130,000-strong assembly of supporters at Moscow’s Olympic Stadium, Luzhniki, presidential candidate Vladimir Putin said that the elections victory was not enough to rid Russia of its problems. 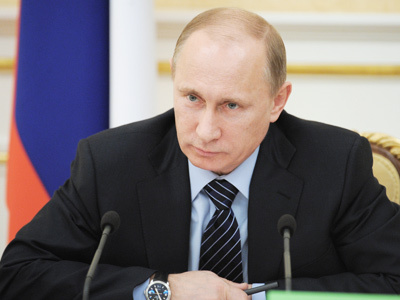 Putin also announced that despite he was sure in victory as “it was in the genes” of those who listened to him, the “winner-nation” will still have a lot of work to do to build a strong and prosperous state.”It is not enough for us to win, we also must overcome a large number of problems that we have enough, just like anyone does. 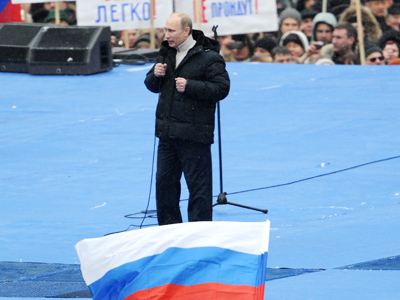 This is injustice, bribery, rudeness of the bureaucrats, poverty and inequality,” Putin told the rally. One more subject of Putin’s short address was a call not to allow foreign politicians and ideas to affect Russian internal affairs. “We will not allow that anyone interfered with our internal affairs and we will not allow anyone to impose their will on us, because we all have the will of our own and it helped us to win in all times,” Putin declared. In the end Putin quoted classical Russian poetry and likened the current election campaign to the 1812 war with Napoleon, calling for supporters to die, but not lose. 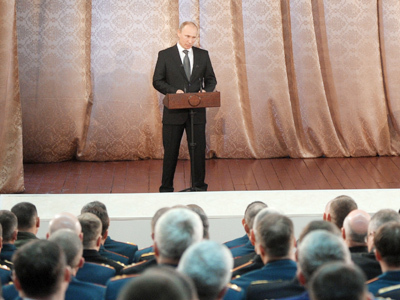 “The battle for Russia is continuing, the victory will be ours,” Putin concluded. The rally is attended by 130,000 people and, as the official number of places in the stadium is limited to 84,500, many of Putin’s supporters were placed on the football pitch. Before the rally started, 30,000 people marched several kilometers through the nearby river quay. 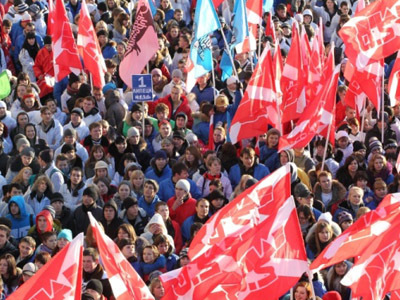 It should also be noted that the actual number of rally members exceeds the one in the official request filed to the Moscow City Administration. This is not the first time the number of Putin’s supporters has exceeded the official expectations and the punishment for this offence is minimal – just a 2,000 ruble fine (under $70). The march was marred by a strange incident. Police said they detained about 70 foreigners, mostly citizens of Uzbekistan, who were hired to take part in the pro-Putin rally. Police said this was a provocation by Putin’s competitors, who wanted to present the incident to the media as a proof that pro-Putin rallies use hired foreigners to boost their numbers. 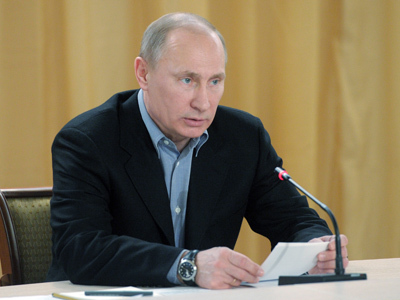 Neither Putin’s official opponents nor the non-system opposition have commented on the incident.